If separation can damage – sometimes seriously – the bond between child and mother/caregiver, maternal deprivation is the disruption of the bond so that the attachment ceases to be, at least temporarily. Sometimes this disruption is permanent: Bowlby (1969) estimated that 25% of children experiencing maternal deprivation are irreparably damaged. He attributed maternal deprivation to lengthy or many separations, leading the BEIGE/PURPLE biological driver to form and maintain attachments to eventually become frustrated – often with pathological results. Bowlby based his ideas partly on the work of other developmental psychologists and partly on his own research – most notably his famous ‘Forty-Four Juvenile Thieves’ study (1944). Between 1936 and 1939 an opportunity sample of 88 children was selected from the London Child Guidance Clinic where Bowlby worked – he literally picked suitable children from consecutive referrals. Of these, 44 were juvenile thieves and had been referred to the clinic because of their stealing. The other 44 ‘controls’ had been referred to him due to emotional problems – though they did not display anti-social behaviour. The 2 groups were roughly matched for age and IQ. On arrival at the clinic, each child had their IQ tested by a psychologist who also assessed the child’s emotional attitudes towards the tests. At the same time a social worker interviewed a parent to record details of the child’s early life. The psychologist and social worker made separate reports. A psychiatrist (Bowlby) then conducted an initial interview with the child and accompanying parent. The 3 professionals then met to compare notes and read reports from school, courts, etc. The psychiatrist conducted a series of further interviews with the child and/or parent over the next few months to gather more in-depth information about the history and psychological characteristics of the child. Each child from both groups was eventually classified into one of 6 categories, as shown in the upper table left. 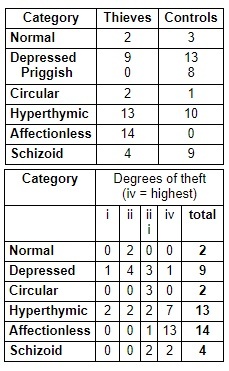 Bowlby also categorised ‘degrees of theft’, as shown in the lower table. He found that some of the children had experienced “early and prolonged separation from their mothers”. He diagnosed 32% (14) of the thieves as ‘affectionless psychopaths’, but none of the controls were. Of the thieves diagnosed with ‘Affectionless Psychopathy’, 86% (12) had experienced a long period of maternal separation before the age of 5 years. They had spent most of their early years in residential homes or hospitals and were not often visited by their families. They had been undemonstrative and unresponsive since infancy. 2 of them showed some affection but matched the criteria in other ways. Only 17% of the thieves not diagnosed as affectionless psychopaths had experienced maternal separation. 2 of the control group had experienced a prolonged separation in their first 5 years. Bowlby concluded that maternal separation/deprivation in the child’s early life caused permanent emotional damage – in its extreme, leading to Affectionless Psychopathy. According to Bowlby, this condition involves a lack of emotional development, characterised by a lack of concern for others, lack of guilt and inability to form meaningful and lasting relationships. Bowlby reasoned that the thieves could steal precisely because they didn’t care for others. 13/23 (56%) level iv persistent thieves were ‘Affectionless’. Affectionless psychopaths could also be terribly impulsive. Bowlby claimed that once the attachment bond was broken, the negative effects could not be reversed or undone. There are problems with Bowlby’s ‘Forty-Four Juvenile Thieves’ study. For one thing, Bowlby being the psychiatrist who interviewed the participants meant he knew which children were thieves and which were from the control group so he may have been biased in the way he conducted himself with them and interpreted their answers. (To avoid researcher bias, a double blind procedure should have been used.) Bowlby also made up categories such as ‘Hyperthymic’ and ‘Affectionless Psychopathy’ – they were not validated concepts. Michael Rutter (1981) contends that some of the boys were moved so often in infancy that they never really had a chance to form an attachment relationship – and, therefore, the issue is privation rather than maternal deprivation. It has been commonly observed that many children who are emotionally deprived are also physically small. One of the most cited studies into the growth-stunting effects of what Bowlby termed maternal deprivation is Elsie Widdowson’s classic 1951 observation of 50 children in a German orphanage. The children were physically underdeveloped, despite having good nutrition. The orphanage supervisor was so harsh and unsympathetic towards the children that Widdowson nicknamed her ‘the Dragon Lady’. Dietary supplements were given to the children but had little effect. However, when a new, caring and empathetic supervisor – dubbed ‘the Cheerful Lady’ by Widdowson – was appointed, the children started to put on weight and grow taller. Again it has been observed that children deprived of their maternal relationship for too long develop low intelligence. However, Rutter argues this could simply be due to lack of cognitive stimulation. In formulating his ideas on maternal deprivation, Bowlby was much influenced by the work of René Spitz (1945) and William Goldfarb (1947). In 1945 Spitz reported on his study of children in South American orphanages. Staff were overworked and untrained; they rarely spoke to the children or picked them up, even for feeding. Spitz found that the developmental imbalance caused by the unfavourable environmental conditions during the children’s first year produces irreparable psychosomatic damage to normal infants. He coined the term ‘anaclitic depression’ – though he also used the term ‘marasmas’ – to refer to the devastating effects of emotional deprivation on very young infants. When the love object comes back to the child within a period of 3-5 months, recovery is prompt. Spitz found that, if the child is deprived longer than 5 months, they will show the symptoms of increasingly serious deterioration. Anaclitic Depression involves symptoms of apprehension, sadness, weepiness, withdrawal, loss of appetite, refusal to eat, loss of weight, inability to sleep and developmental retardation. René Spitz & Katherine Wolf (1946) confirmed much of Spitz’ earlier observations in their study of 91 American babies and infants whose mothers were in prison. While in prison the women cared for their babies from birth to around 9 weeks. Then the babies were taken away and placed in an orphanage. Although the standard of physical care was high, the infants showed signs of distress – frequent crying, a loss of appetite and a failure to gain weight. The children would cry and cling to observers. However, the children resumed their normal behaviour and gained weight if they were returned to their mothers at or around 3 months 0f age. If the children were separated from the mothers for substantially longer, they experienced severe Depression, with symptoms of weight loss, insomnia, illness and a lack of emotion displayed in their faces. They would not move to interact with their carers. Spitz referred to the children’s state as ‘hospitalism’. Over a third of these children lost the will to live and died – many before their first birthday – in spite of good nutrition and medical care. To illustrate their findings, Spitz & Wolf filmed a number of the children in this and similar studies, with some of the footage comprising Spitz’ 1952 short film Psychogenic Disease in Infancy. Below are some disturbing scenes from the movie – copyright © 1952 New York University Film Library. Spitz’ work shows that, in a sense, it is possible to die from lack of love. This shows just how powerful the BEIGE/PURPLE vMEME harmonic is – especially at the beginning and end of life. (One partner in a old age married couple dying shortly after the other is a recognised sociopsychological phenomenon – attributed by Ana Vitlic et al in 2014 to much greater cortisol production in older people as a result of bereavement.) The utter frustration of PURPLE’s safety-in-belonging needs causes such stress in some that the BEIGE will to live is compromised and the immune system starts to break down. Goldfarb carried out a longitudinal study of children in orphanages up to 10-14 years old. The institutions were very clean but lacked human contact or stimulation. Babies below 9 months were kept in separate cubicles, intended to prevent the spread of infection, and their only contact with other people occurred during changing and feeding. Goldfarb was able to observe 2 naturally-occurring groups: one was chosen for fostering before they were 9 months old; the other group was fostered between the ages of 6 months and 3.5 years, the majority after 9 months. The second lot were put into (sub-)groups of 15- 20 and supervised by a single nurse. For matching purposes Goldfarb studied 15 from each group. The children were tested at 3, 6, 8 & 12 on IQ, language skills, social maturity & ability to form relationships. The ‘institutionalised’ group performed significantly less well than the ‘early fostered’ group on a range of cognitive and emotional measures. By 14 the mean IQ of the institutionalised group was just 72 – approaching retardation level – compared to the early fostered group mean of 95. The institutionalised group were characterised by bursts of aggression, were very dependent on adults and less able to form relationships. By 12 many in the institutionalised group were ‘loners’, being more emotionally withdrawn than ‘normal’ children. Of course, Goldfarb’s sample size was very small and he ignored individual differences – some of the 15 early fostered group may have been pre-selected for fostering precisely because they were brighter, more attractive, less prone to illness and more sociable. Nonetheless, the study is considered high in ecological validity and was certainly hugely influential on the likes of Bowlby. Interestingly, the study also illustrates the difficulty sometimes in distinguishing between deprivation and privation – Goldfarb himself writing: “…strong anchors to specific adults were not established”. Michael Rutter has been arguably Bolwby’s greatest critic – though not so much on the central tenets of Bowlby’s work but on some of his methodologies and some of his conclusions. No correlation was found between separation through the mother being ill and delinquency. However, where separation was due to psychiatric illness or discord, then the children were 4 times more likely to engage in delinquency. Rutter concluded that the reason for the separation of mother and child was a more important factor than the separation itself. Separations that were handled well and included satisfactory alternative emotional support for the child were much less likely to lead to delinquency than separations involving family discord and argument. Rutter’s findings don’t directly contradict Bowlby but they do indicate clearly that other factors mediate to what extent separation and deprivation have an influence. Rutter’s findings do suggest strongly that maternal deprivation and the kind of emotional and beahvioural difficulties associated with it are from inevitable. Of course, Rutter, while distinguishing between deprivation and privation, offers no real guidance to distinguish separation and deprivation from each other, in the way Bowlby did. Which tends to make his findings not as helpful as they could be. In the modern Western world, there are few, if any orphanages of the kind Spitz and Goldfarb investigated and parents are encouraged to maintain very close contact with their children when they are separated – eg: through hospitalisation. However, a key modern application for this kind of research is the effects on children when their parents’ marriage/cohabiting relationship breaks up. Usually the children stay with the mother and it is the bond with the father which is damaged (separation) or even broken (deprivation). Within 2-3 years 50% of the parents not living with the children loses regular contact with them. Rudoph Schaffer (1996) notes that nearly all children are affected negatively by divorce but young males in particular are more likely to suffer from Depression. – in younger children, refusing to be left at nursery or insisting their bedroom light be left on all night. Children of divorced parents tend to be more disruptive and disobedient both at home and at school – especially boys who tend to be more aggressive. Girls are more likely to withdraw into themselves. Martin Richards (1996) finds that children of divorced parents are more likely to leave school early and take low paid, low-skill jobs. They are more likely to start a family before the age of 20 and are more likely to get divorced themselves. However, Schaffer argues that many of the ‘effects of divorce’ attributed to divorce may be due to parental conflict before, during and after the divorce. When a relationship is falling apart, conflict between the parents may well lead to disruptive behaviour from the children both at home and in school. These behavioural patterns will most likely then persist through the divorce and beyond it. This then leads to the question of which is better for the children: conflict in a family that stays together or the family breaking up? According to research by Paul Amato & Bruce Keith (1991), children from divorced families with little conflict are better adjusted than children from 2-parent families where there is regular conflict between the parents. Certainly, the work of David Fergusson, John Horwood & Michael Lynskey (1992) seems to support the notion that parental conflict is a prime factor in the development of problematic behaviour in children. The researchers looked at 1265 children who had been studied each year to the age of 13. The rates of parental separation, reconciliation, arguments, violence and sexual problems were recorded. All these apart from sexual problems were found to correlate to rates of criminal offending by the children. The worst effect was that of parental discord. It seems that parental conflict undermines PURPLE, with the result that RED emerges to compensate for the damaged attachments. The children were assessed on self- image, self-esteem, social life, school success and health. On all measures the intact children did best and the reconstituted children worst. The small minority of children who were prepared in advance for reconstituting tended to do better than those who weren’t. The very worst children were those who had undergone multiple reconstituting. Of course, it must be born in mind that families normally undergo discord before break-up and reconstituting and that conflict is a characteristic of both divorce and reconstituting. Cockett & Tripp found that in intact families, if parental conflict worsens, so do academic, social and emotional issues for the children. So it may be that the effects of conflict are the real source of distress for children, rather than the divorce and reconstituting in themselves. Almost predictably, s reconstituted family breaking up makes things that much worse for the children. Bryan Rodgers & Jan Pryor (1998) confirmed that children experiencing 2 or more divorces have the lowest adjustment rates and the most behavioural problems. How parents treat their children in the wake of a break-up, of course, often has a profound effect on the children. E Mavis Hetherington, Martha Cox & Roger Cox conducted an interesting study into this in 1979. They studied 4-year-olds living with their mothers following divorce and in regular contact with their fathers. In the first 12 months, the mothers became more authoritarian, increasing the number of demands and restrictions and becoming less affectionate. The children became more aggressive and inflexible – especially the boys. Domestic routines were disrupted. Fathers tended to become less disciplinarian and more indulgent, treating the child and buying presents. 2 years on from the divorce, the mothers had tended to become more patient and communicative and domestic life was more structured with both parents. The children’s behaviour settled down accordingly. Interestingly Jennifer Jenkins, Marjorie Smith & Philip Graham (1989) note that many 9-10-year-olds increase contact with siblings and friends as a means of coping. E Mavis Hetherington & Margaret Stanley-Hagan (1999) note that most children -around 75% – adapt at least reasonably successfully to parental separation. However, Richards (1987) contends that most children resent their separation – beyond the child’s control – and may fantasise about getting the parents back together. David Demo & Alan Acock (1996) note some children develop better attachments to their parents after divorce. The researchers attribute this to no longer being in an environment of marital conflict and to parents being more attentive and supportive after divorce. Parental death leads to Depression? The ultimate form of separation/deprivation is, of course, the death of a parent. So does parental death cause more damage than separation/deprivation? Antonia Bifulco, Tirril Harris & George Brown (1992) studied 249 adult women who had been deprived of their mothers before they were 17, either through separation for more than a year or through the mother’s death. The ‘mother’s death’ group overall had twice the normal rate of Depression and anxiety disorders in adulthood, However, the women whose mothers had died before they were 6 had a particularly high rate of Depression. There was nothing like the same level of Depression in the other group, though, where separation had occurred before the child was 6. There is a difference between permanent separation (deprivation) and temporary separation – even when substitute maternal care – eg: father, grandparents – is provided. However, Rutter (1981), based on his Isle of Wight studies, claimed to have found that parental death was coped with better than high conflict divorce. Richards (1987) distinguishes between the effects of divorce, leading to resentment and stress, and death, leading to Depression.